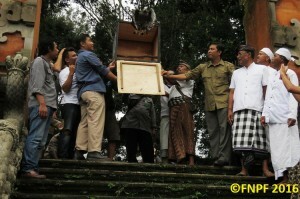 I april 14th 2016, Friends of The National Parks Foundation (FNPF) released one crested serpent eagle (Spilornis cheela) at Besikalung Temple, Bali. The bird was finally able to fly to the wild after spending 21 months in our Bali Wildlife Rescue Center (BWRC) at Tabanan Regency, Bali. 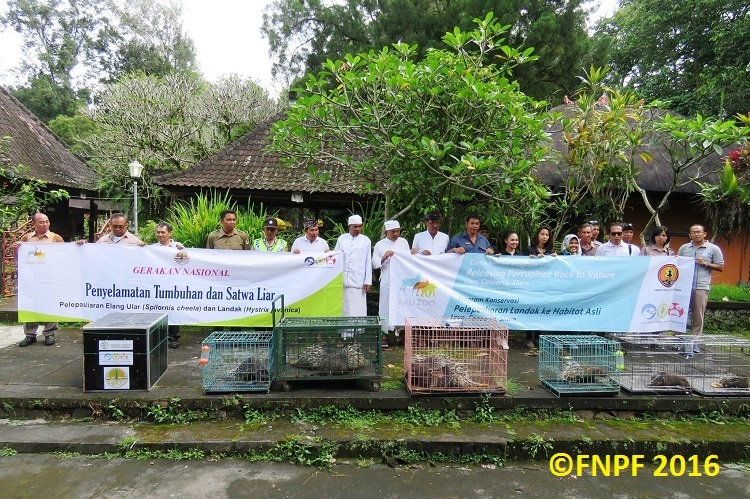 The release was also attended by representatives from Nature Conservation Agency (BKSDA), Bali Zoo, and the local communities. Although small, the event was very intimate and full of meaning. Before being released the eagle had to undergo a series of religious ceremonies to be accepted as the new citizen of Besikalung Temple. The ceremony was conducted by the local priest who personally gave his blessing to the bird. 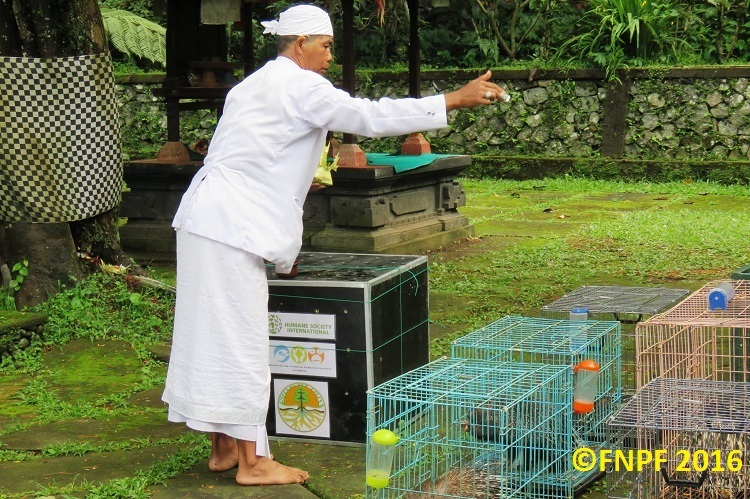 After the ceremony, around 10 om, the cage was opened and the bird flew straight toward a nearby forest just outside the wall of Besikalung temple. The Bird is Being Released. According to Dr. Rini, our veterinarian, the eagle was in bad condition when it first arrived at BWRC. “Its primary wings were cut and some of its feathers were broken” Dr. Rini told us while observing the bird behaviour in its new home. Dr Rini also adds: “It took a year for the wings to be fully healed and another several months before it could finally fly”. Dr. Rini recalls how the bird arrived in BWRC. “it was brought in by a foreigner who bought the bird from a poacher and immediately gave the bird to us.” According to Dr. Rini the healing process was the hardest part while the training part was pretty straight forward. “it grew up in the wild, so it still remembers how to hunt and survive in the wild”. 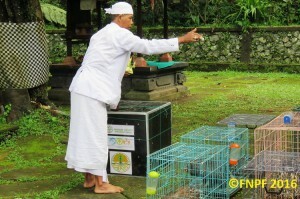 We chose to release the bird at Besikalung temple for a very strong reason. First, Besikalung temple is one of the most important and oldest temples in Bali. 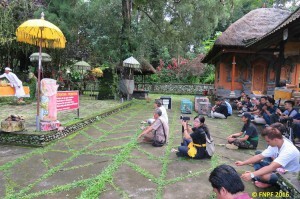 Fortunately, Besikalung Temple is not a major tourist attraction and the habitat is still well preserved. Secondly, for 5 years FNPF has been working together with the local community there to build and maintain a wildlife sanctuary in Besikalung Temple. As a result from this cooperation a set of traditional laws (awig-awig) was enacted which makes any kind of hunting or poaching of wildlife in Besikalung punishable by traditional law. Derfor, we believe that the bird can survive well here because the local communities are working together to protect the wildlife. The Staff Are Praying Before Releasing the Animals. This event is only possible because of the cooperation between entities that really care about the issue of conservation in Bali. Those who work hard to make this event possible are: FNPF, BKSDA, Bali Zoo, Humane Society International of Australia, and the local communities. 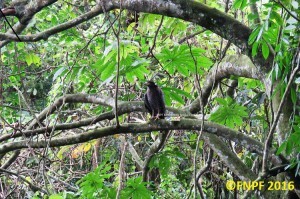 In this event, BKSDA has helped us with getting the necessary permit to release wildlife in Besikalung. Bali Zoo also participated in this event by releasing ten Malayan porcupines (Hystrix brachyura). Desuden, the support from Humane Society International of Australia is very crucial as they remain our major donors for our rehabilitation project in BWRC. Endelig, we also want to thank the volunteers who have given us their precious time and energy for helping our project in BWRC. Group Photo With BKSDA, Bali Zoo, and Local Communities. For More Information About BWRC Click Here.